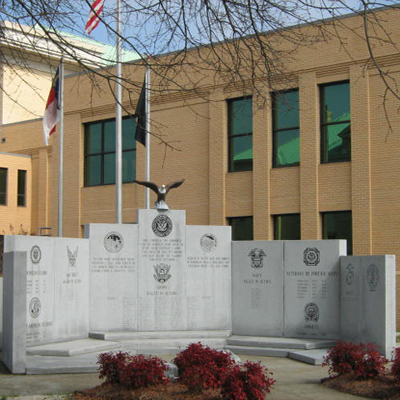 Description: The monument is composed of nine engraved granite slabs arranged in a semicircle outside the courthouse. The slabs increase in height toward the center, and the center slab topped with an eagle. The monument has three flagpoles behind the slabs. Post dedication use: This monument has become a site for Veterans Day and Memorial Day activities and ceremonies. Landscape: The memorial sits between the old Randolph County Courthouse and the new courthouse.